The Force Awakens script has leaked online and it hints at a return to Cloud City in Star Wars: Episode VIII. The leaked script breaks down the visions that Rey had when she first picks up Luke's lost lightsaber in Maz Kanata's basement. The first image from her vision has been confirmed as "a hallway... from deep inside Cloud City", Lando's Bespin home from ​The Empire Strikes Back​. For those of you who have just jumped on the Star Wars bandwagon, let me explain the importance of Lando Calrissian. 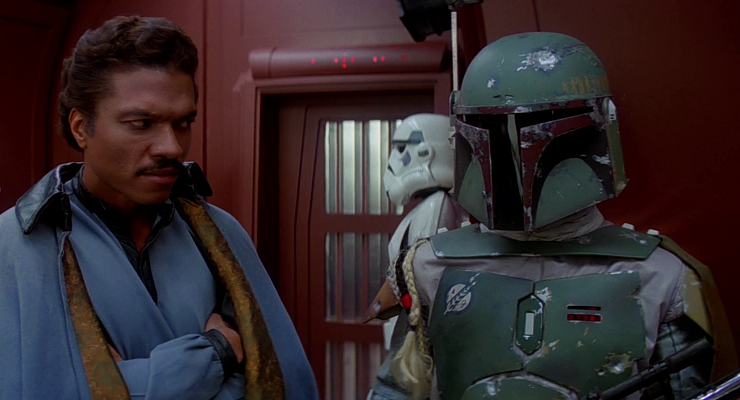 Calrissian was a smuggler who became Baron Administrator of Cloud City and, later, a general in the Rebel Alliance. He was the owner of the Millennium Falcon before losing it to Han Solo in a game of sabacc. After losing the Falcon, Calrissian put an end to his days as a smuggler and became an entrepreneur, setting up a small mining operation on the planet Lothal before eventually becoming the leader of Cloud City in the skies of the planet Bespin. During the Galactic Civil War, Darth Vader arrived on Cloud City in order to lay a trap for his son, Luke Skywalker. As part of the trap, the Dark Lord of the Sith forced Calrissian into tricking a group of Rebels, including Solo and Princess Leia Organa, leading them to Vader himself. Though Vader promised to leave Cloud City without an Imperial presence, Calrissian felt the deal had been altered to the point where he could no longer tolerate it. Calrissian alerted his citizens to the Galactic Empire's presence and impending occupation, and he ordered an evacuation. He helped the Rebels try to rescue Solo, who had been frozen in carbonite, from Boba Fett, but the bounty hunter escaped. Calrissian joined the Rebel Alliance and set out to find Solo. After locating him in the palace of Jabba the Hutt on Tatooine, Calrissian aided in his rescue. The Rebels returned to the fleet and Calrissian became a general, volunteering to lead the assault on the Death Star II during the Battle of Endor. During the battle, he piloted the Millennium Falcon into the battle station's core, firing the shot that destroyed it. Now why would they add this little clue into Rey's vision? Because in true Star Wars fashion Lando doesn't show up until the sequel. Also note that since he was a major part of bringing down the Death Star and Han's "friend", there is no reason why he wouldn't appear in Episode VIII. With the script confirming Cloud City was in Rey's vision that cements the return of the planet Bespin and Mr. Billy Dee Williams.